Kensei Takeda enjoys using vintage and antique gems, including green and orange agate, smoky topaz, turquoise and canary topaz, in giving "rebirth" to new pieces. KENSEI Takeda's love for dinner parties led to a second métier, all because he couldn't find the perfect napkin rings. "I love cooking, I love using beautiful china," said the Japanese-born hairstylist, who owns Chez Kensei Hair Salon on Kapiolani Boulevard. 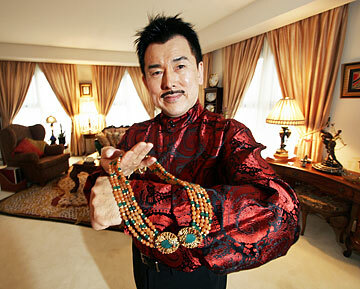 "I always invite women because women really appreciate beautiful table, but I couldn't find napkin ring. Everything so plain. So I thought, hmm, maybe I can make." Already a collector of vintage jewelry and strands of semiprecious beads, he ended up stringing beads of different sizes and colors together in multiple strands, with no two rings alike, to the delight of his guests, who immediately tried to re-purpose them by squeezing them over their fingers and onto their wrists, to no avail. "They said, 'So beautiful. Can you make it slightly bigger so we can wear as bracelets?'" 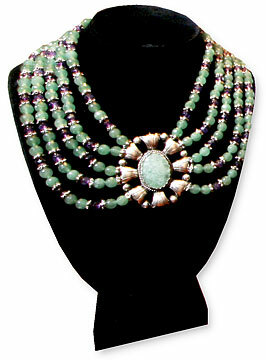 Kensei Takeda reuses vintage and antique gems in new pieces. The designer obliged and kept going. 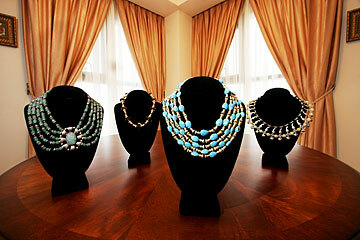 Kensei, largely known by his first name, is still, in his spare time, fashioning bracelets and earrings and necklaces. He'll be showing his creations March 19 during a sold-out 40th-anniversary "Jewelry as Art" luncheon and jewelry fashion show at the Royal Hawaiian Hotel for members of the Shufu Society of Hawaii, a nonprofit group that advocates understanding through cultural activities and communication. The show can be summed up in one word, "perfection." Although Kensei has worked with local designers in the past, he now buys designer garments by the likes of Issey Miyake, Gucci and others so that he can control the entire presentation without stomping on any local designer's ego. "That way, if I don't like something, just cut," he said, demonstrating with his fingers forming imaginary scissors. The focus on jewelry is important because just as the perfect coiffure is the crowning touch for individuals, he said, "Jewelry is the last piece of accent. It brings out the person's personality, everything. It's part of a person's presentation." THROUGH ALL his work, Kensei strives to help others strike a balance in their appearance. Even as a boy, he demonstrated an affinity for visual harmony. "When I was 10 years old, other boys were reading comic books. I was reading fashion magazines, interior design magazines. I was interested in art books, books about beauty." Vintage and antique gems, including green and orange agate, smoky topaz, turquoise and canary topaz are used in new Kensei Takeda pieces. He might have inherited his aesthetic from his father, an oil painter. Kensei studied painting and sculpture as well, but concern about making a living led him to beauty school, including five years studying with internationally renowned makeup artist Shu Uemura. At 24, Kensei was named champion at the fourth annual All-Japan Mode Cutting Competition, and at 26 he opened his first salon in Tokyo. After opening several salons in Tokyo, he moved to Honolulu to open Chez Kensei in 1989. All the while, he was collecting antique and vintage jewels, obis and other beautiful objects that caught his eye, content to admire them "as is" until his experiment with napkin rings led him to the concept of deconstructing them to give rebirth to new creations. The pieces he refashions from his collection of antique and vintage beads and findings manage to be both classic and a bit bohemian, in keeping with Kensei's eclectic sensibility. "I love antiques because everything is handmade, everything hand-painted," he said. Even so, he doesn't have an allegiance to any particular era or style. "I don't like too Art Nouveau or too Art Deco, so everything, including some new, is mixed in." That mixed aesthetic might also apply to his view of perfection, which might be more forgiving than others' perception. "Don't have to be everything perfect. Each person is different. Sometimes it's a matter of money, but some things that are expensive are not always good. Sometimes what is comfortable, more simple, is good. You always have to think about balance." NO MATTER what fashion mavens might say, personal style belongs to the individual, and Kensei says he never tries to push his views on his clientele, knowing "it's very difficult to change." Even so, he's seen it happen. Through jewelry choices, he's often been witness to individuals' growth over time, watching their comfort level change as they gain confidence and push beyond commonly accepted boundaries. 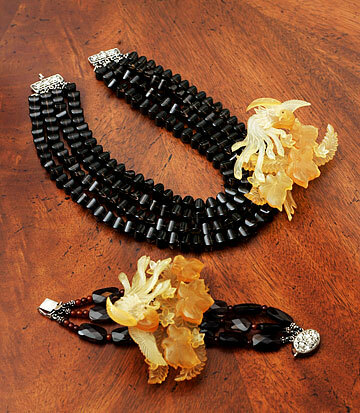 This necklace and bracelet by Kensei are highlighted by antique tortoise-shell ornaments that were once part of a Japanese bridal hair ornament. "Some clients tell me, 'I don't want anything too big,' but I tell them try and they get used to. Then they want bigger, bigger, bigger. "Sometimes they buy something and don't wear, just keep it inside dresser. They say they cannot wear. Three years later, they can wear!" Just don't look for Kensei's work to hit the mass market any time soon. Pieces will be available for sale, for $500 to $2,000, after the show and through private appointments, but to date he has no commercial aims. He's been asked to create pieces for retailers but says, "I don't want the pressure. Now, I enjoy making just a few." For information about Kensei designs, call his salon at 949-3134.